Stone fruits—including peaches, apricots, and cherries—are delicious, versatile, and rich with nutrients. Don’t miss out on their wide range of health benefits! Stone fruit remains a culinary favorite because of their versatility. What do cherries, apricots and mangoes have in common? Beside being delicious and healthy, all three are members of the stone fruit family. Stone fruits are part of the Prunus genus, which shares a similar characteristic—a very large and hard seed, or “stone.” They’re generally abundant during the months of May through early October and range in flavor profiles from sour to sweet. The nutritional profile of stone fruit varies, depending on the type and variety of fruit, but they are all generally rich in important nutrients that can benefit your eyes, bones, heart, digestive system, and more. Although each member of the stone fruit family has its own unique origin story, most of them are of Asian and European origin, primarily in areas with a temperate climate. A few, such as the Beach plum, are native to North America. #1. They’re rich in vitamin C. Mangoes and raspberries are among the fruits containing the highest amounts of vitamin C. This antioxidant has various benefits, including heart disease protection, immune-boosting effects, and atherosclerosis For more information, check out Vitamin C Benefits Protect Us Against Heart Disease—and Lower the Risk of Early Death. #2. Stone fruits are a good source of fiber. Raspberries and blackberries contain 8 grams of fiber per serving, while cherries, apricots, and mangoes contain three grams per serving. A diet high in fiber promotes digestion, lowers cholesterol, reduces the risk of cancer, and aids in weight loss. For more information, check out High-Fiber Diet: Good for the Gut, Good Your Overall Health. #3. They can protect your eyesight. Carotenoids, a class of antioxidants that promote healthy eyesight, are found in nearly all brightly colored fruits and vegetables. Luckily, stone fruits fall right into this category—apricots, plums, and mangoes are all adequate sources of carotenoids. Blackberries and raspberries are also rich in anthocyanin, another antioxidant that protects your eyes from various diseases. But wait, there’s more: Peaches, nectarines and apricots are a good source of beta carotene (a precursor to vitamin A), which is also linked eye health. 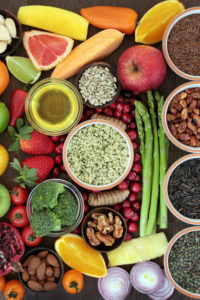 For more information, check out Eating for Eyesight: Which Foods Protect Your Eyes? #4. Stone fruits are good for your bones. Plums, peaches, raspberries and blackberries are among the fruits with the highest amount of vitamin K, which plays an important role in maintaining bone health. It’s needed for bone mineralization and maintaining calcium balance, two processes very important for bone health and strength. For more information on vitamin K, check out Vitamin K Supplement: Which Type is Best for Osteopenia and Osteoporosis Treatment? They’re a rich source of potassium. 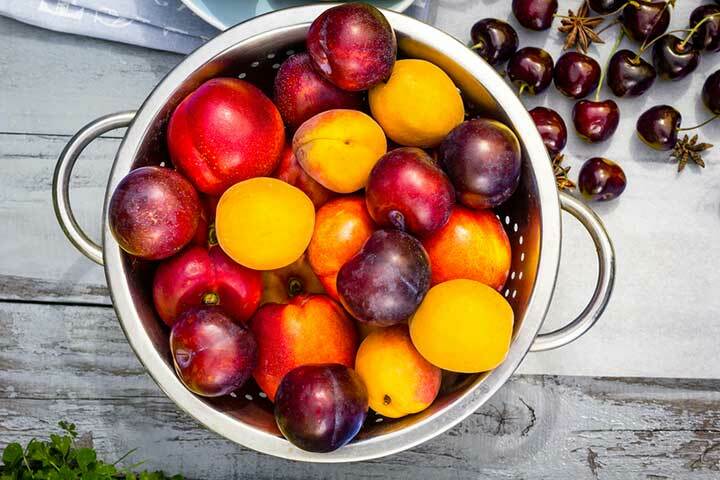 Apricots, cherries, mulberries, blackberries, nectarines, mangoes, and plums are among the fruits with the most abundant source of potassium, which benefits some of the most important functions of your body, including maintain nerve function and regulating muscle contractions. For more information, check out Potassium Benefits Your Heart, Bones and More. #5. Cherries are natural treatment for gout and insomnia. Eating cherries every day can lower your risk of a painful gout attack, according to a study published by Arthritis & Rheumatology. The study found that gout patients who ate 10 to 12 cherries per day or took cherry extract over a period of two days reduced their attacks by 35 percent over a year. Tart cherries are also a natural source of melatonin, a hormone that promotes sleep. In one study, after eating tart cherries, melatonin levels rose significantly in test subjects. For more information, check out Gout Foods: Keep These 6 Items in Your Diet and The Tart Cherry Juice Sleep Solution: Beat Insomnia With This Natural Remedy. #6. Dates are a sweet and healthy treat for diabetics. Although the sweetness of dates may make you think they aren’t good for diabetics, they can actually be beneficial. In fact, a study found that eating 100 grams of dates for four weeks led to no increase in blood sugar levels. Dates don’t have a very high glycemic index, are full of fiber, and are rich in antioxidants—all factors that help with diabetes treatment. For more health benefits of dates, check out Are Dates Healthy? 5 Reasons to Add Them to Your Diet. Grill them. Coat your grill with oil or cooking spray and place your favorite stone fruit cut-side down on the grill for 3 to 4 minutes. Sprinkle a little brown sugar on top or drizzle on your favorite glaze before serving. Freeze them. Slice some peaches, cherries, or mangoes and keep them in your freezer so that they’re ready for a delicious morning smoothie. Can them. Canned peaches make for a quick, delicious dessert or oatmeal topping. Juice them. Replace your morning OJ with some cherry juice to get some anti-inflammatory benefits or prune juice for its digestive benefits. Or, keep some apricot or peach nectar in your fridge to mix into teas, gravies, and glazes. Eat them dried. Mix dried cherries or apricots into muffins, pancakes, scones and trail mix. add, almonds, anti inflammatory, anti inflammatory benefits, antioxidant, antioxidants, are dates healthy, Are plums good for you, arthritis, atherosclerosis, bacteria, beta carotene, blood sugar, blood sugar levels, bone, bone health, calcium, calories, cancer, carotenoids, cherry juice sleep, cholesterol, colon cancer, cooking, dates, diabetes, diabetes treatment, diabetics, diet, digestion, digestive, eye health, eyesight, fiber, Glycemic index, gout, gout attack, gout foods, health, heart disease, high fiber diet, high glycemic, high glycemic index, honey, hormone, insomnia 2, melatonin, milk, muscle, natural remedy, natural treatment, natural treatment for, nutrients, nutrition, osteopenia, osteopenia and osteoporosis, osteoporosis, osteoporosis treatment, potassium, potassium benefits, protein, rheumatology, risk of colon cancer, sleep, smoothie, strength, sugar, sugar levels, supplement, tart cherry juice sleep, treatment for gout, vegetables, vitamin, vitamin a, vitamin c, vitamin k, vitamin k supplement, your bones.